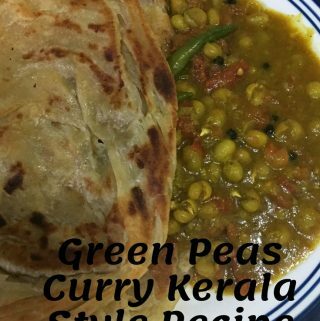 Green peas curry without coconut or onions or green peas masala for chapathi , poori, idiyappam or appam using tomatoes can be easily prepared in a pressure cooker using fresh or frozen green peas or using dried green peas. 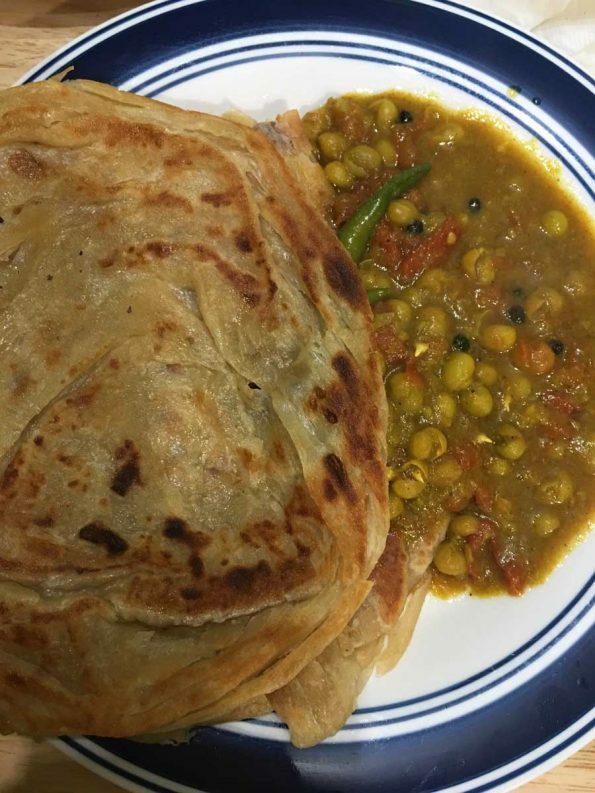 In the below picture, green peas curry is served with Kerala style parotta (Kerala style paratha), see recipe for homemade Kerala parotta here. I have used dried green peas to make the green peas curry using tomatoes, but you can also use fresh or frozen peas if you have that. See my post on potato peas curry here which too is prepared without using coconut. This is a simple green peas curry which makes a delicious, quick and easy to prepare side dish for chapathi, poori, bahtura, appam, idiyappam etc (some of these are South Indian kerala style breakfast items). If you are using dried whole green peas like I use in this recipe, you have to soak for few hours prior to cooking, which I will explain in the recipe instructions. If you are using fresh peas or frozen peas, you can skip the step of soaking the peas and you can easily prepare the curry using fresh or frozen peas. So here is how you can make this easy green peas curry for chapathi or poori following this simple and easy green peas curry using tomatoes. This green peas curry using tomatoes and spices can be made easily in a pressure cooker and it makes an easy, yummy side dish with chapathi, poori, idiyappam, appam, paratha etc. I made this using dry green peas but you can also use fresh or frozen peas with a slight adjustment to the recipe. Wash the green peas and soak in enough water for about 6 to 7 hours. After soaking, drain the water and wash the peas again and keep aside. If you are fresh peas or frozen peas, you can skip the soaking, just wash them and keep aside. Wash the tomatoes and chop in to small sized pieces, keep this aside separate from the green peas. When the mustard seeds splutter, add the curry leaves and fry for a few seconds. Add green chilies, garlic and ginger, saute for about 1 to 2 minutes. Add the green peas to the pressure cooker and saute for another 1 minute. Add chopped tomatoes and salt, mix well and saute for another 2 minutes. Add the spices - turmeric powder, red chili powder, coriander powder and garam masala powder and stir well. Add the sugar and water, stir well all the contents. Close the pressure cooker with the lid and safety valve in place, cook in medium heat for about 10 to 12 minutes or until 2 whistles come. Wait for the pressure cooker to cool down. Once the pressure cooker is cooled enough, open the cooker and see if the peas is cooked and the gravy is enough. Add the black peppercorns, stir and let it simmer in low to medium heat for another 2 minutes. Serve the green peas curry hot with chapathi, poori, idiyappam, appam or any rice or flatbread as you wish. 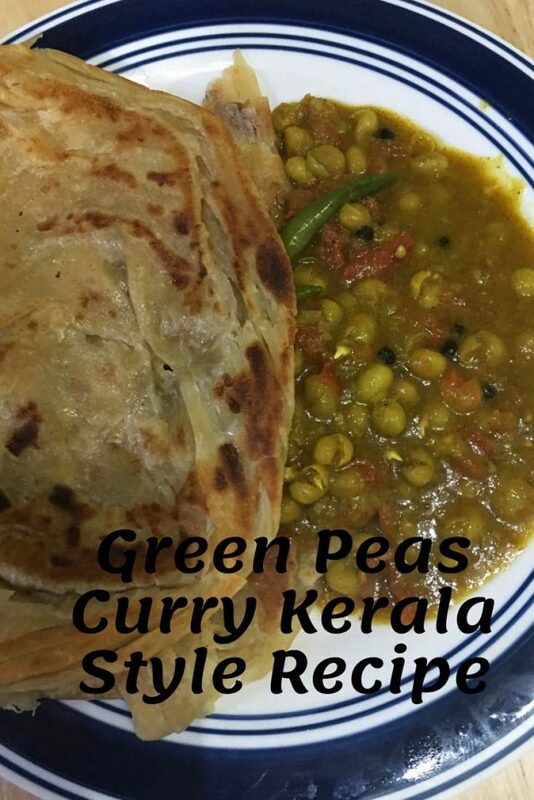 Hope you found this post on green peas curry without coconut or onions helpful in making easy, healthy and delicious green peas curry for a yummy and quick side dish for chapathi or poori.